We are a company with multiple skills and expertise in the field of sheet metal processing. Since 45 years ago we have been serving the Italian and European markets, such as Germany, France, Switzerland, Austria, and Poland. Mevar offers our clients all of the techniques available in the sector: prototyping, designing and manufacturing of moulds, 2D and 3D laser cutting, punching, moulding through blanking, bending, deep drawing and mechanical machining of various types. Therefore we can propose the most convenient type of machining based on the kind of item and the quantity to be manufactured. For example we can provide advice on laser cutting for low quantities or moulding for high serial production, always with an eye on the quality of the items produced, which must be impeccable. Manufacturing our steel moulds starts with designing that ensures a flawless mould. With innovative 2D and 3D laser cutting we can process various metals with precision. We also offer tube cutting operations. We can mould sheet metal for blanking, deep drawing, curving, and bending with various mechanical and hydraulic moulds. In our highly structured mechanical division we manufacture items using milling, turning, and electroerosion techniques. We supply all of Europe and any industrial sector, as well as engineers, architects, and designers who need to develop/manufacture new products or even improve existing ones. Today Mevar Srl is the main supplier for leading Italian manufacturers of lamps, housewares, home appliances, motor vehicles, and many other types of items, such as components for the automotive industry. Our task is to give shape to ideas, resolve technical challenges, renew processes for ever more effective and competitive production, optimising time and costs. In addition to planning and designing, we collaborate with our customers to develop projects and research new products and components that engender greater performance and decrease costs. To offer all of these services, we boast a state-of-the-art technical office, with annexed metrological room specialised in prototyping and testing, at the disposal of clients for any simulations or sampling necessary to develop new ideas. This know-how has positioned us in an ever more competitive marketplace that now demands not just manufacturing capacity but also, and above all, problem-solving, innovative ideas, and growing quality. Mevar's mission is clearly mapped: to offer diverse technical options among which selecting and ensuring utmost quality in manufacturing. 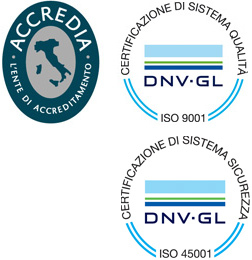 Our reliability is also ensured through the ISO 9001:2015 quality certification that we achieved in October 2017 with the prestigious DNV.